American rabbi; born at Kolin, Bohemia, 1814; died near Cincinnati, Ohio, June 22, 1871. He was descended from a family of Talmudists, his great-grandfather, Jacob Illowy, having been rabbi of Kolin. He studied in his native city, later at the school of Moses Sofer in Presburg, and received the degree of Ph.D. from the University of Budapest. Illowy continued his studies at the rabbinical college in Padua under S. D. Luzzatto, and then returned to his native country, where for a time he was engaged in teaching; but political conditions forced him to look for a rabbinical position elsewhere. He was prominently mentioned as a candidate for the position of "Land-rabbiner" of Cassel ("Allg. Zeit. des Jud." 1850, p. 326), but, not being elected, he emigrated to the United States, where he was successively rabbi at Syracuse, New Orleans, and Cincinnati. Illowy was one of the ablest champions of Orthodoxy, being a man of great Talmudic learning and an accomplished linguist. He was one of the promoters of the rabbinical conference held at Cleveland in 1855; but, the general feeling at that gathering being in favor of Reform, he did not exercise the influence to which his scholarship and eloquence entitled him. He wrote numerous articles for the Jewish press. 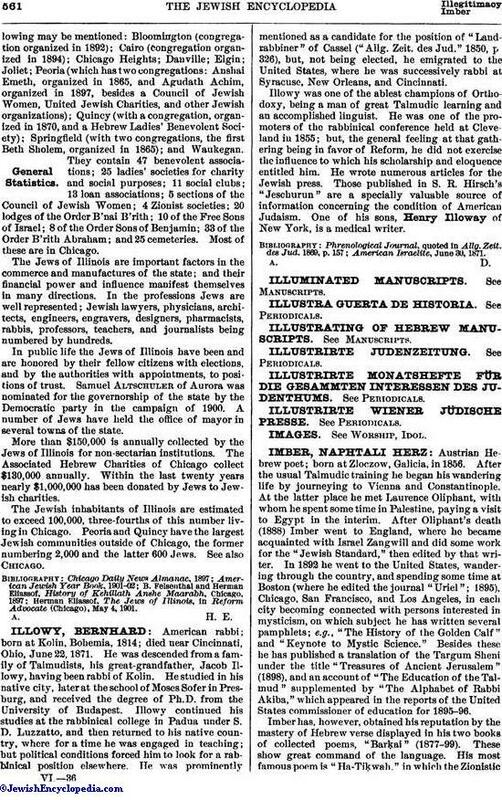 Those published in S. R. Hirsch's "Jeschurun" are a specially valuable source of information concerning the condition of American Judaism. One of his sons, Henry Illoway of New York, is a medical writer. American Israelite, June 30, 1871.